In 2003, Vedanta Resources, a UK-based mining company signed an MoU with the Government of Orissa (GoO) to construct a 1 MTPA alumina refinery and coal thermal plant (75 MW – half a million TPA of coal) at Lanjigarh in Kalahandi district. In September 2004, The Ministry of Environment and Forests (MoEF) gave environmental clearance to the company on the basis of the company’s assertion that it would not divert forestland. The alumina refinery project will require 3 million tones per annum bauxite which is proposed to be sourced from the nearby Niyamgiri hills, sacred to the local indigenous tribe the Dongria Kondh. Following this, in 2004 the clearances granted to the Lanjigarh alumina refinery of Sterlite Industries were challenged by local activists and a special committee was sent to investigate and report back to the Supreme Court. The committee noted the lack of in-depth studies about impacts of the mine on the water regime, flora, fauna and on the Dongria Kondh tribes living at Niyamgiri Hills. Its report also pointed out that the area came under Schedule V of the Indian Constitution, which prohibits the transfer of tribal land to a non-tribal group. Furthermore, the report accused Vedanta of providing wrongful information and thereby circumventing the law. While the arguments continued in the Supreme Court, the company meanwhile continued with the construction of the refinery in 2006, causing the displacement of over a hundred tribal families, and the company then proceeded to argue that the adjacent mine was essential to the refinery. In 2007, the Supreme Court granted permission to a Vedanta subsidiary Sterlite, to proceed with the mining, despite the committees report and the mobilization of local communities, as long as they paid some extra damages to offset the negative externalities of the project. 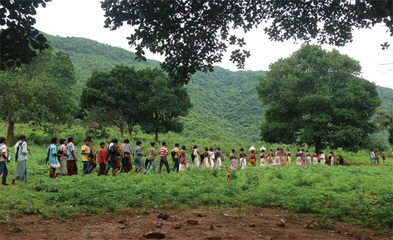 However, while environmental clearance was granted, forest clearance was still pending, and following a report in 2010 by the Saxena Committee that argued that the local tribals should have the right to protect their rights under the Forest Rights Act. Finally in 2013, the Supreme Court ruled that the local inhabitants should decide if mining in Niyamgiri hills will affect their religious and cultural rights as protected by the FRA. Following this, the Odisha government drew a list of 12 affected villages in Rayagada and Kalahandi districts, to hold palli sabha (referenda in their local councils). In July 2013, the 12 villages unanimously voted to reject the mining project in the first ever environmental referendum in India. The case is now up to the Central Government to decide and it appears that Vedanta has lost this battle, but the rejection of mining in Niyamgiri means Vedantas gaze has now shifted to neighbouring districts that hold bauxite deposits of some 1.8 billion tonnes to feed the refinery. Whether the communities there will also be granted the same right to decide remains to be seen. In 2017, Prafulla Samantara, one of the social activists in the area and born in a family of farmers, was granted the Goldman Environmental prize  for his hard work against mining but also dams in the Mahanadi river. He is also a member of the Anti-POSCO Movement (POSCO Pratirodh Sangharsh Samiti) and of the National Alliance of People's Movements (NAMP). This award recognizes the indispensable defense of life that these communities are doing not only to preserve the environment but also lives and livelihoods. There was a long process of litigation for 10 years. 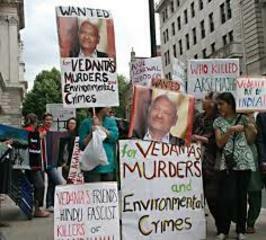 There was support from international actors against Vedanta in London. 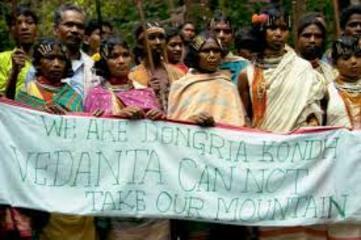 Legislation protecting forest of adivasi groups has been applied. A precedent was set for the first environmental referendum to decide a mining project in India. Development of Alternatives The proposal is to leave the Niyamgiri hills undisturbed. The sacredness argument was decisive in the end. Why? Explain briefly. While the refinery in Lanjigarh has been built, it depends on bauxite brought by train and truck from far away. Vedanta Ltd has been unable to get final permission for mining bauxite from the Niyamgiri Hills. The Supreme Court of India asked in April 2013 for public consultations in villages and hamlets in the Niyamgiri hills. Unanimous rejection was recorded in July and August 2013. Right of tribals to equality and equal protection under the law (Article 14 of the constitution). Right to live in dignity (Article 21 of the constitution). Right to life and existence. Recognition of Forest Rights Act Section 2a regarding Scheduled Tribes and other forest dwellers. Temper, Leah & Joan Martinez-Alier. The God of the Mountain and the Godavaram Case: Net Present Value, indigenous territorial rights and sacredness in one bauxite mining conflict in India. Ecological Economics.